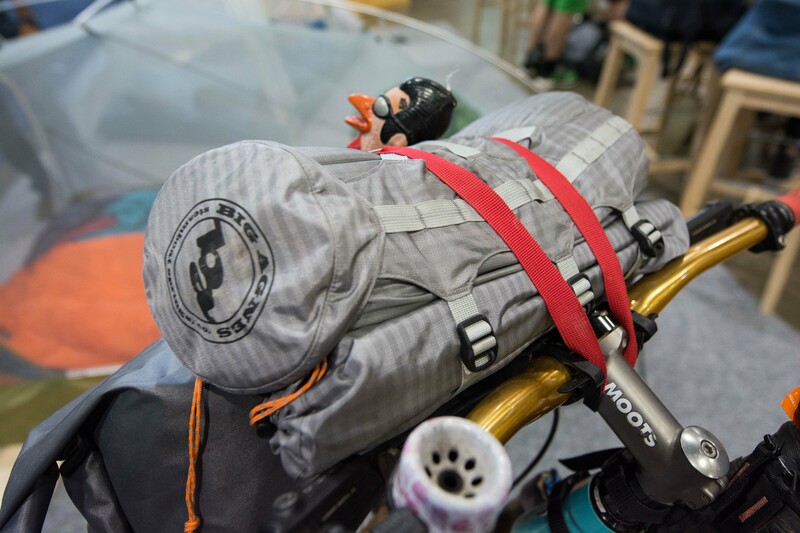 It’s not very often that avid cyclists get the chance to preview the latest in gear at Outdoor Retailer, so I jumped at the chance to peruse the aisles for Elevation Outdoors this year with the intention of digging up a few products that’d crossover nicely for bikepacking. Overall, there’s very little product specific to bikepacking —even in the cycling industry — but the crossover potential for lightweight hiking and camping gear is almost endless. 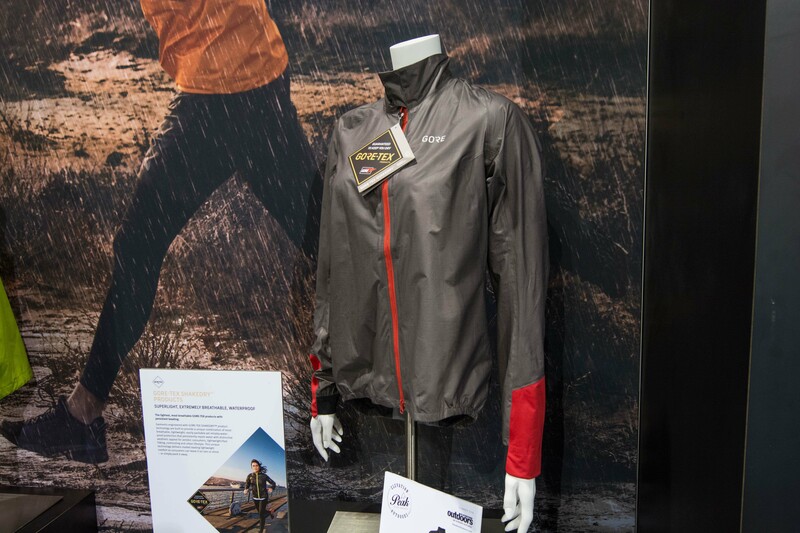 Here’s a few things that caught my eye during the 2018 Outdoor Retailer Summer Show. The one bikepacking-specific product I found was Big Agnes’ new “Bike Pack” tent models. Basically an updated version of their popular Fly Creek and Copper Spur models, the lightweight tents come with poles that fold down to 12 inches and 13 inches, respectively. In addition, each model has a helmet cradle to hang it between the fly and mesh tent wall, as well as larger interior tent pockets to help spread out cycling gear that has a tendency to add up a bit more than that of hikers. The extra pole connectors and material for storage bump up the weight only a mere 3 ounces by comparison to the Classic versions which weigh in at 2lbs 2oz for the $380 Fly Creek 2-person, and 3lbs for the $410 Copper Spur 2. For even lighter options, Big Agnes offers carbon poles with their Dyneema version tents. As an example, a 1-person Fly Creek comes in at a mere 1-pound pack weight, but it’ll cost you $800. If that’s not light enough for you, or you’re looking for more of an emergency option for rides with questionable end times, Big Agnes has a 6 ounce bivy that’ll be available next spring. It’s price is still to be determined, but it’s a single layer of Dyneema laminate that’s designed for regular use(verses some products in this category that are only good for a dozen or so uses), and won’t need to be retreated with water repellent product down the road. As light as Dyneema is, Big Agnes says it’s actually stronger than many of their heavier and thicker materials used in the less expensive tents. One more teaser from Big Agnes is a set of new ultra lightweight 40-degree sleeping bags — the Downtek Pluton that weighs in at a mere 15-ounces, and the 1-pound 3-ounce synthetic Verga. 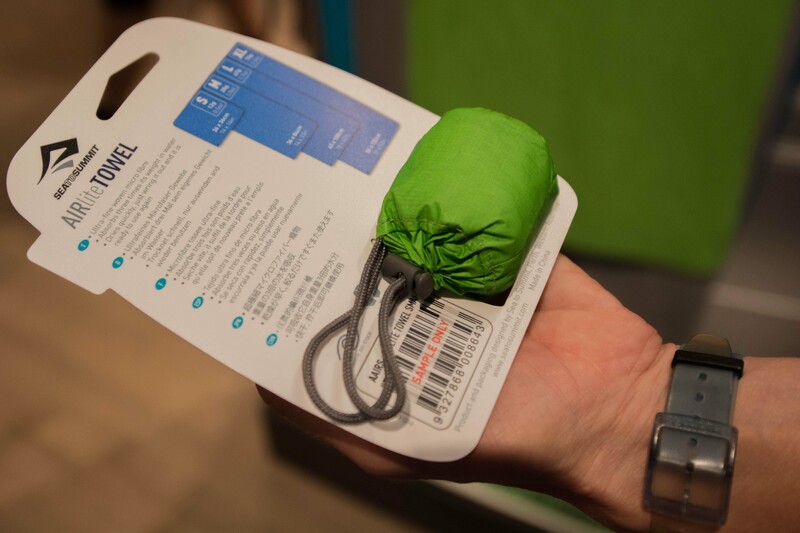 Both bags feature Big Agnes’ integrated sleep system that relies on the thermal properties of a sleeping pad that slides into the outer backside of the bag, which keeps pack size to a minimum. Look for the new bags sometime in January. Hidden down in one of the lower level halls of the Colorado Convention Center was Knog, the Australian company that most people know by their little silicone commuter lights that came out about a decade ago. They seem to have come a long way since those days, as their new PWR system products are quite impressive. 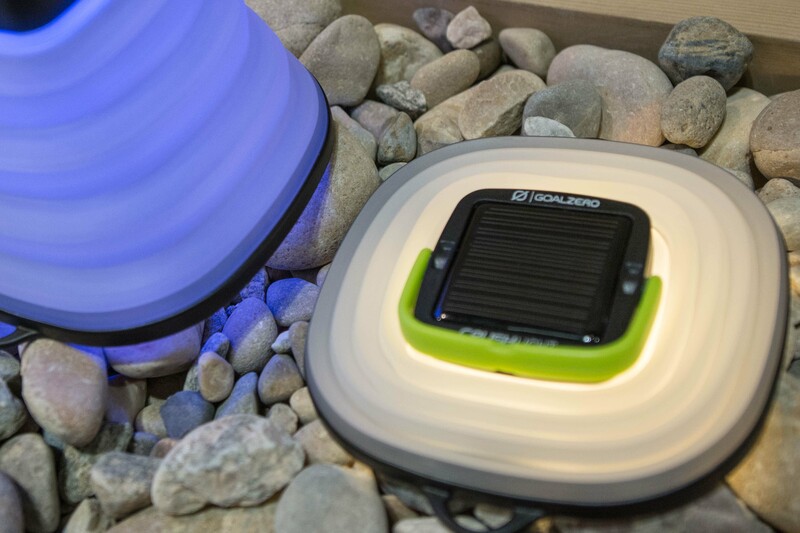 Based on a battery that not only plugs into several of their other products, but doubles as a battery pack that’ll charge most small electronics(smartphone, camera, etc) via a standard USB, the PWR line allows the purchase of things like a headlamp a la carte from one with a battery. So, you can have one battery source for a bike light, headlamp, camping lantern, or Bluetooth stereo. Pricing also reflects the individual products that are sold with or without batteries. As an example, the speaker runs $65 a la carte, or $99 with the battery. 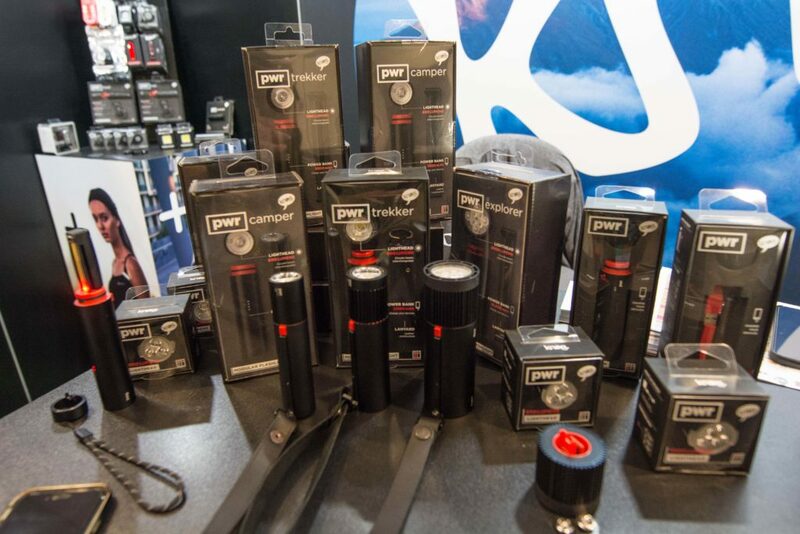 General price range for the PWR line is $45-$200. Have you been wishing someone made an ultralight, titanium coffee filter for your bikepacking adventures? Well, Vargo has, and it’ll be available this fall for $50. The filter features adjustable feet that’ll conform to a myriad of mug sizes, and while I didn’t catch the exact weight, it basically felt light enough that if it’s something you’d have room for and plan on using, the feathery feel of it suggested that weight would be a negligible add-on. Vargo was also showing off their new No-Fly 2-person tent, which they say offers the most floor space for the weight in this category. That equates to 34 square feet and a peak height of 43 inches. Available this fall, the No-Fly weighs in at 2.6lbs, and will retail for $500. 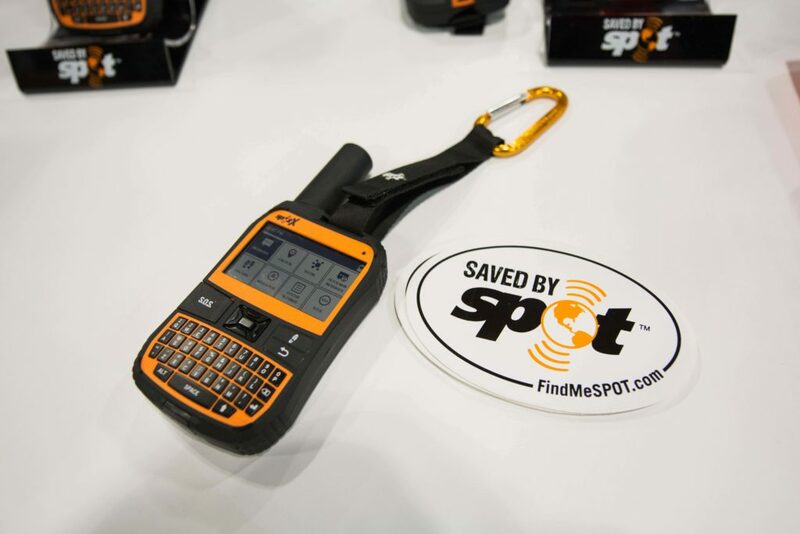 Spot’s new tracking device now offers two-way communication, verses the original version that only allowed tracking from others, and a panic button. For a monthly fee with several pricing options, the Spot X comes with its own satellite based “phone number” and allows the user to text, email, and even post directly to the usual social media haunts. Users can sign up for one month of service at a time, too, which comes in handy when the average person may only take one truly off-grid trip a year. The rechargeable battery life is said to be 10 days with all systems firing, and will go for a month in sleep mode. The device itself is very water resistant, having been cleared to 1 meter submersion for 30 minutes, so a heavy downpour shouldn’t be anything to worry about. They’re technically available, but it sounds like they’ve already sold out since hitting the market just a few weeks ago. Retail for the device is $249, and 1-month service options range from $14.95-$39.95. The new Wind Jacket is a bit of a misnomer, as its tightly woven nylon material and DWR finish give it a much more rain-repellent quality than the average shell in this category. Designed with cycling in mind, it features long sleeves, reflective piping, stretchy side panels, and a dropped back to keep muck from flinging up into the tops of your gangster shorts. For proper wet-weather riding, this may not be what you’d want to rely on, but if there isn’t anything on the radar that’d pack more than a light shower, it’s a very lightweight and packable option that’s relatively inexpensive at $85. If money is of less concern than proper weather resistance out in the backcountry, Gore’s Shakedry jacket is a single-layer fully waterproof jacket that weighs a mere 3-ounces for a size medium. 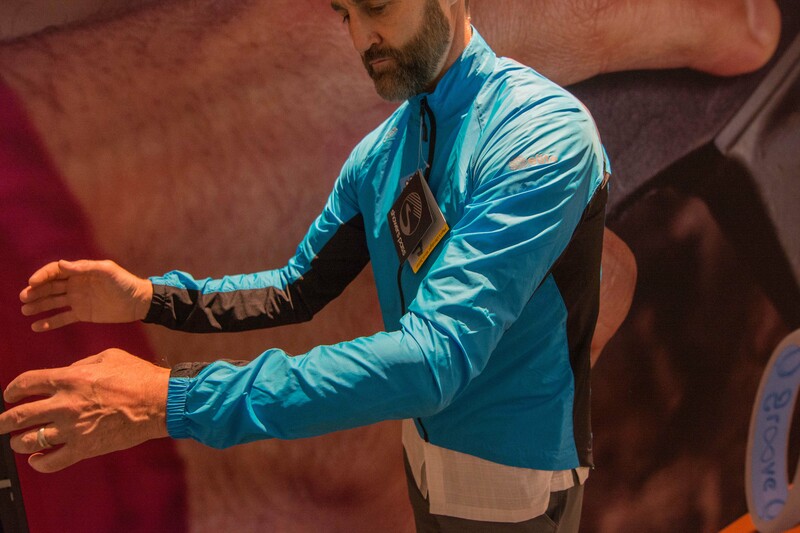 At $300 it probably won’t be something that every cyclist will run out and grab, but the performance of an untreated, water phobic and breathable single layer piece like this would be the go-to for anyone looking for something that easily tucks into packs or pockets, and works like it needs to when the weather turns sour. If there’s such a thing as bike glamping, then maybe Goal Zero’s new Crush Light would fit into standard equipment to do so. Or, maybe for the minimal space its collapsible size takes up, it could be something that’d be a nice addition to the usual minimalist gear list. 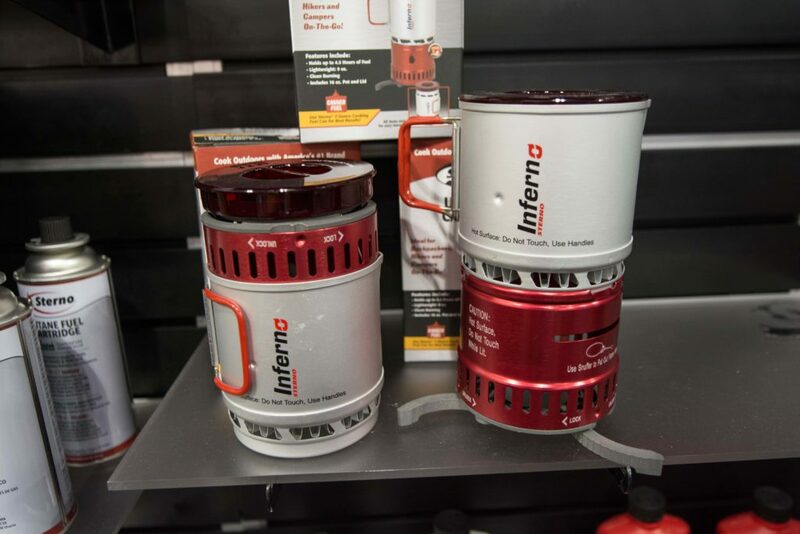 The micro-USB rechargeable LED lantern provides 60-lumens on high, and has a little solar panel on top that will take a solid day to juice it up if it’s completely drained. The Crush’s handle detaches for easy hanging, and depending on if it’s in high or low mode, it’s said to last 3 to 30 hours. Retail for the basic white bulb is $20, and $25 for the 6-color version — both versions feature a candlelight mode that flickers, too. Goal Zero has also updated many of their battery packs and solar panels, and are worth a look if you’re in the market for either or both. Sea to Summit could be a one-stop shop for almost all things needed for the camping portion of bike-packing, but we’ll concentrate on the newest product. The Air Lite towel comes in sizes S-XL, with the small measuring 14 inches square and the XL at a traditional bath towel rectangle of 30×60 inches. The lightweight and packable towels boast up to three times their weight in water retention ability, and will be available this winter for $10-22, depending on size. An inflatable down pillow sounds like the perfect balance of packability, comfort and function. The 2.5-ounce pillow will retail for $64, has a 3-way air valve, and comes with 3M adhesive sticky pads that are designed to affix to Sea to Summit sleeping pads and keep the pillow from sliding around, but my guess is that they’d work on any nylon style sleeping pad. Look for the Aeros Down Pillow sometime in March. The new Primus Lite features a lower profiled burner that in effect makes the system lower and more stable while cooking. A quarter-twist locks the triangular-shaped burner to a 1/2-liter hard anodized pot that has a lanyard style handle which can be positioned to allow the stove system to hang, if needed. 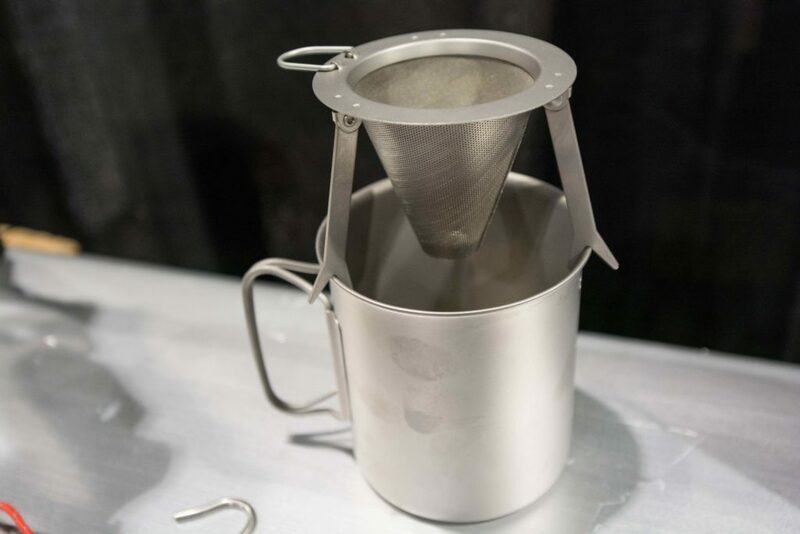 Other notable features include a 2-minute boil time, a 1-hour burn time on a 100gm fuel can, an integrated pour spout on the pot lid, a built-in igniter, and there’s even a French Press accessory option. 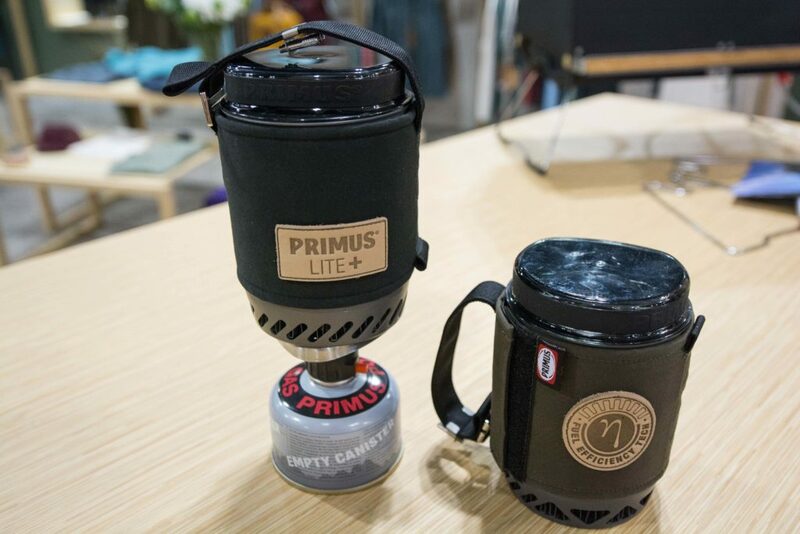 The Primus Lite retails for $114 and will be available this fall. A less expensive option to the Primus Lite is Sterno’s integrated cook system for $25, plus $3 for a fuel can that’s said to run 2.25hrs. Of course, it’ll take roughly three-times the time to boil at a claimed six-minutes, so it’s really a question of how much of a hurry you’re in compounded by your budget. The one big bonus in regards to a Sterno system is the ease of finding their fuel cans at just about any grocery store across the country. 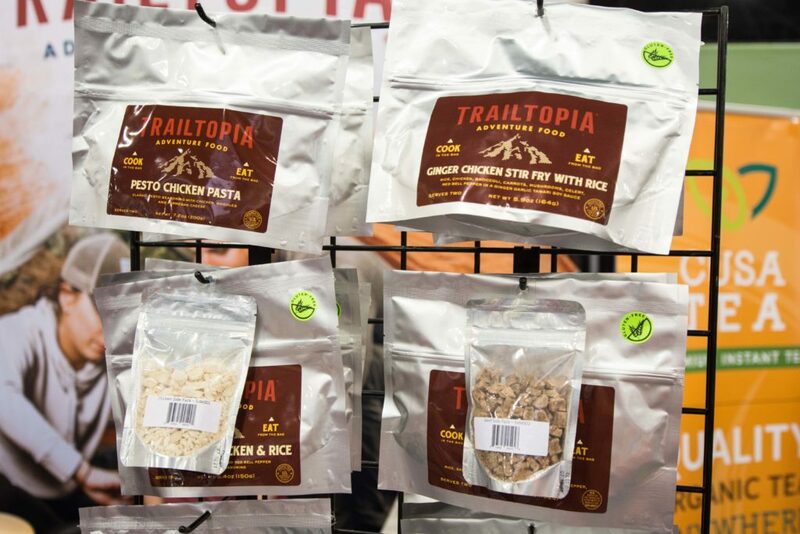 Based in Minnesota, Trailtopia seems like they’ve paid attention to the usual dehydrated food options, and done a good job on improving them. They use horizontally-oriented bags designed to be easier(shallower) to eat out of, only freeze-drying what’s needed and leaving the other ingredients in their natural state to improve taste and texture, and have color-coordinated packaging for breakfast, lunch and dinner meals to make it easier to pick the right meal out from the abyss of your pack. There are plenty of gluten-free options along with a few vegetarian option that feature hemp seed for its protein, and pricing ranges from $8-11 for a 2-serving dinner that should net roughly 850-calories total. And a great option is adding extra protein to meals with small side packs for $3.50, which would add 27-grams of protein out of a 30-gram content from the chicken option. I tried a sample of the Beer Braised Chicken Stew, and it was quite tasty, even by non-freeze-dried standards. For those trips where cooking isn’t on the itinerary, things like quality jerky are always at the top of my fuel list. It doesn’t need to be refrigerated, is lightweight for how many calories it packs, and can cram in to just about any pack without having to worry about squishing it. 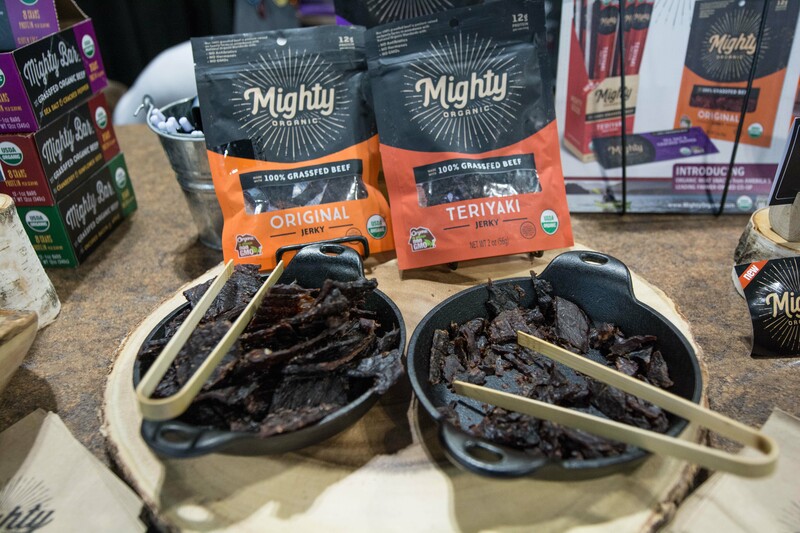 Mighty Organic’s taste and flavors, along with it being from truly grass-fed beef, have added it to my list of top choices from here on out – the bacon and apple flavor probably kept me at their booth an extra five minutes so I could keep sneaking little samples. 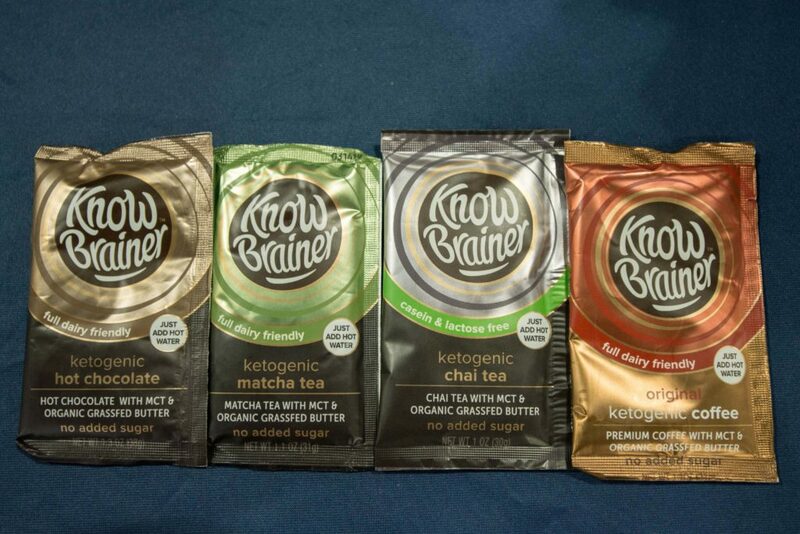 Available in four impressively tasty flavors — coffee, chai, hot chocolate, and matcha – the lightweight, packable options are great for camping, and happen to be keto-friendly. Maybe less desirable for some, but at 220-calories per serving, they’re also rich in calories, which I greatly appreciate on those trips that require as much fuel as possible. The chai and matcha were impressively on-point for being mixed with water, and the hot chocolate wasn’t bad, but could’ve used a touch of milk or milk-like product to make it a bit more full-bodied. Of course, all flavors could be richened up with substituting water for the aforementioned. This will be an easily debatable item for bike packing, but depending on region and season, it could be an absolute must. The Radius is a 7-ounce, rechargeable battery powered gizmo that provides 11-square-feet of mosquito-free zone for up to 6-hours at a time. It uses the battery to heat up an element that vaporizes what was described as an EPA-approved synthetic chrysanthemum-based oil called metofluthrin. The Radius retails for $50 and comes with a spare 12hr cartridge of the stuff, and refill cartridges come in 12hr or 40hr versions for $8 and $20, respectively. 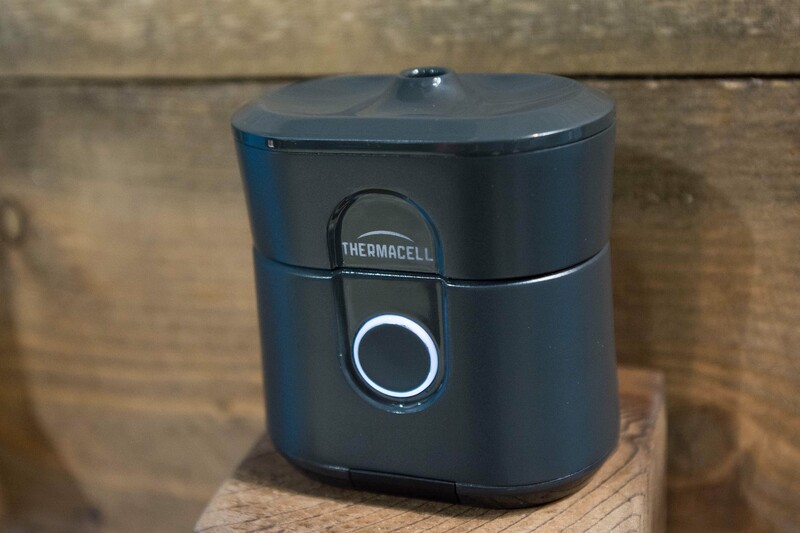 Thermacell states that it doesn’t hurt honey bees, has a 98% effective performance of keeping mosquitos away, but doesn’t kill them — it’s just a deterrent. Black flies and no-see-ums are said to be deterred from the odorless vapor as well, but it’s not as effective on them as it is on the mozzies.